Come to the country * Fun for the whole family * Bring friends! FREE ADMISSION * Food $10 * Yoga $5 donation * Bring cash. Drooling is free! We accept credit/debit/SNAP for purchases. From southbound on US1, turn west (right) on Bauer Drive (SW 264 St.) and go approx. 5 miles. 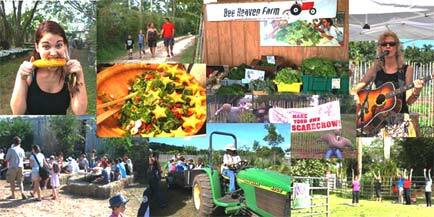 The farm is about 1/3 mile west of Redland Road (SW 187 Ave.) Look for the farm signs and flags on your left. Please angle park on the swale and walk on in. Announcing the 2015 Dinner in Paradise season line up! The New Generation of Chefs in Miami! It is very exciting for Dinner in Paradise to be a venue to give this new generation of chefs greater exposure. Who are these chefs and what are they up to? Let’s find out where their creative expression takes you! You will want to experience the entire season. It’s not just dinner, it’s an experience! Please arrive at 5 p.m. for a cocktail reception, followed by a farm tour, dinner and bonfire. (Arrival time changes to 6pm on March 14th). For reservations, visit paradisefarms.net. Each dinner is $165.50 per person + tax. Reservations are required. Buy a table of 10 and get one seat free. Buy a season of 9 and get one free. GIFT CERTIFICATES ARE AVAILABLE. Paradise Farms would like to thank the event’s generous, long-term sponsors including Whole Foods, Strategic Importers, Schnebly Redland’s Winery, Lucini Italia and Brustman Carrino Public Relations, as well as DIP co-founder Michael Schwartz. Join Brooklyn Brewery’s MASH Tour for A Celebration of South Florida Ingredients: Artisans, Growers, Chefs, and Musicians on Sunday, October 26th at 3:00 pm, held at Paradise Farms. Share a Brooklyn Brewery beer and local delicacies with featured artisans from Kombulicious and Bee Heaven Farm. Get to know your Paradise Farms farmer and learn how your food is grown on a private tour with Gabriele Marewski. Savor a family style meal created by Chefs Cesar Zapata from The Federal and Andrew Gerson from Brooklyn Brewery. $55 for adults, and kids under 10 are free. Please leave pets at home. 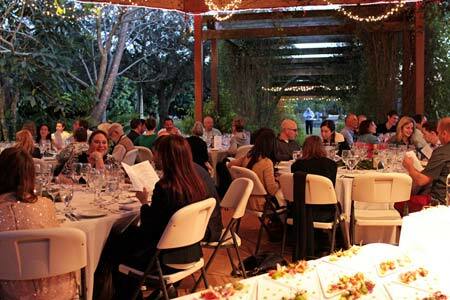 Dinner on the Farm creates unique local food experiences designed to celebrate farms, chefs, breweries, and food entrepreneurs dedicated to good, sustainable food. Through our roaming culinary events, we work to connect people back to the land and to the farmers and artisans who are making our communities a better place to live. We host year-round events dedicated to good food. There’s a new greenhouse going up at Bee Heaven Farm! Before one post can be set, the space for the structure has to be measured and staked out. In this video we meet Frankie the greenhouse guy and his helper, who are the masters of the tape measure. The space they stake out looks like a tight fit. Margie is delighted and excited — her dream is finally materializing! Help Margie’s dream come to fruition and donate to her Indiegogo campaign. Click here to do it online. It’s fast and easy! (Plus you get cool gifts.) Today, Sunday October 12th, is The Last Day! Thanks for your donation! The west grove got knocked down to make space for the new greenhouse. In this video, see how the land gets cleared. Farmer Margie Pikarsky talks about moving forward with the project, no looking back. There’s still a couple days left to donate to the Indiegogo fundraiser, to help Margie pay for the greenhouse. It’s easy to do, just a mouse click away! Every dollar helps, so give what you can. Thanks! Countdown to a deadline! You have only 5 days left (including today) to make a donation! In this Throwback Thursday video, Farm manager Nicole Firori said goodbye to her beloved avocado trees last month. The west grove got cut down to make room for the large new greenhouse at Bee Heaven Farm. Farmer Margie Pikarsky needs the greenhouse to grow more organic veggie and tomato seedlings, both for the farm and for sale to the public. Give a little, give a lot, or give a lot more! Thanks for your donation!